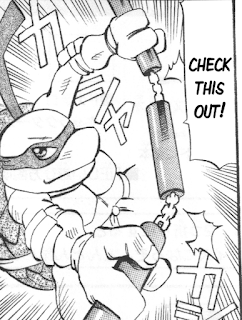 TMNT Entity: New manga translation: "Donatello's New Invention!" 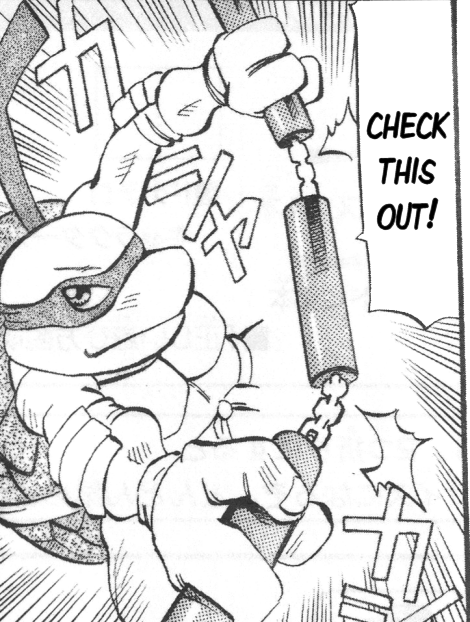 New manga translation: "Donatello's New Invention!" For those of you who dig the TMNT manga section of the site, I've got a new one for you! You can download "Donatello's New Invention" over at the Optical Internet Translation Gang website! This was the pack-in comic by Naoto Tsushima that came with the 2003 Donatello action figure (identical to the Playmates version, distributed in Japan by TakaraTomy). As always, the raw scans were provided by Adam Winters, the translation was by me, and the image/text editing came courtesy of Cryomancer. And if you haven't explored it yet, you can find links to all of our TMNT manga translations on the TMNT Entity manga index.